Microsoft has certainly stolen the show today. Paired with the release of the much-anticipated Windows 7 OS and the opening of the first Microsoft Store in Scottsdale, Arizona, Microsoft began selling PCs and third-party software on the store's Web site. Computers for sale come pre-loaded with Windows 7. And, in an odd gesture, the company is also selling a few Netbooks -- low-cost PCs that Microsoft has battled vigorously in the past. 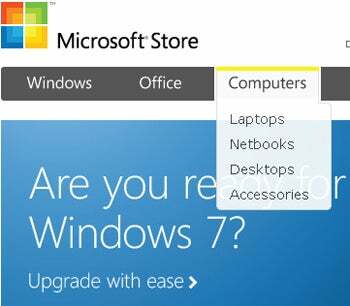 Microsoft opened its online store back in November and only sold Microsoft products. Now all that has changed, quite possibly to increase the visibility and influence of Windows 7, an OS Microsoft finally seems proud of. Usability has increased as well. According to Trevin Chow, Senior Lead Program Manager for Microsoft Store, in a blog post: "We initially launched the online store last November, and since then we have had nearly a years worth data coming in from usability studies, web analytics, and direct customer feedback. Based on all of this data, coupled with the newly expanded product catalog, one of the biggest goals we had in this release was to simplify site navigation for our customers. With the new site, you'll notice a re-designed categorization, navigation and filtering system aimed to make it easier and faster to navigate as well as help you find products you want more quickly." Not only is Microsoft selling PCs, it is also pushing its Xbox 360 video game console and games, and the new Zune HD media player. The pickings thus far are slim, and it's uncertain whether or not Microsoft will broaden its base to attract customers away from sites like Dell and Lenovo and back to the mothership. How much Microsoft is skimming off the top of sales is also undisclosed, but I imagine it's a decent chunk; otherwise the company would never have made the move.